this afternoon versus the SMU Huskies. With a hat trick of Tommies' players having a big game this afternoon, St. Thomas defeated the Saint Mary's Huskies 2 to 0. Jordan Miller and Cassidy McTaggart each had two points and Julia Sharun earned her fourth shut out of the season. The first period was uneventful with no goals being scored. Saint Mary's did not register their first shot on net until the 12 minute mark of the period, as STU out shot SMU 9 to 4 in the first. Cassidy McTaggart would score the eventual game winning tally at 15:03 of the second period with the helpers to Jordan Miller and Erin MacIsaac. Sharun closed the door on 10 Huskies shots in the period while STU fired 9 the other way. St. Thomas would get a little insurance at 4:09 of third. SMU's goalie Sienna Cooke made a nice save on Jordan Miller that resulted in a face off to her right. Cassidy McTaggart won the draw back to Paige MacDonald, who promptly sent a perfect pass to a waiting Jordan Miller at the side of the SMU net and fired a quick shot for a two goal Tommies advantage. The Huskies would pull their goalie late in the third period trying to get on the board but Julia Sharun was up to the task and denied everything that was thrown her way the rest of the game. Final shots on goal favoured STU 30 to 27. 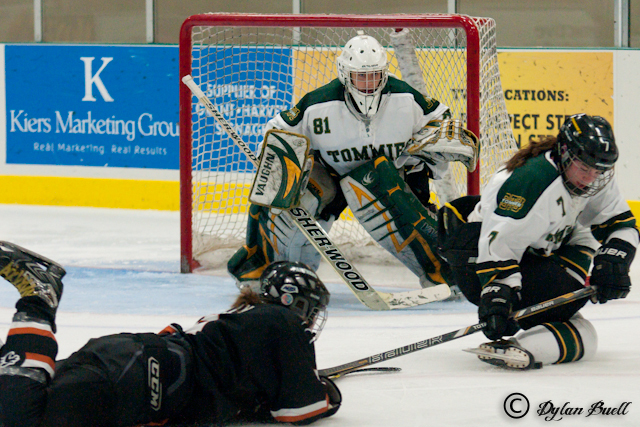 The win was huge as the Huskies sat 1 point behind the Tommies for second in the AUS standings at the start of the game. STU now has a 3 point advantage on SMU and 4 points on UPEI, who they play next Saturday night in Charlottetown.